OPEN is actively involved in projects in the Bushwick Neighborhood of Brooklyn, NY. The murals are strewn throughout the complex, adorning 7-story corridor walls, one ceiling, and a parking ramp near a public garden. With the intent of bringing vibrant color and character to the area, all of the murals are massive and can be viewed from the development’s multiple courtyards. In addition, five of the murals are visible from parks that are open to the public; a strategic design choice meant to enliven and engage the local community. To accomplish this fantastic feat, OPEN’s focus has been twofold: 1) partnering with local organizations such as Art Bridge and the Bushwick Collective, as well as with local artists, to design and create striking murals; and 2) developing community engagement programs which allow the people of Bushwick the opportunity to either actively contribute to the selection of the mural design, or to participate in stimulating educational programs with the artists. 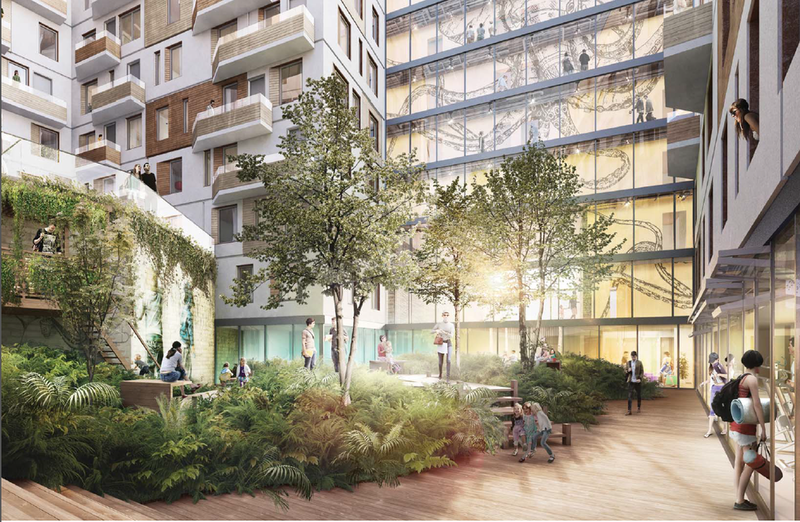 Nestled between the two Denizen Development buildings sits a lovely public park which will offer both beautiful landscaping and a permanent collection of five sculptures. Open calls for artists to design and produce these sculptures will be held in the upcoming months. The final selection will be made by an independent panel, and the winning figures will be installed in April 2019.